Cook In / Dine Out: Salmon with Tomatoes and Zucchini "Spaghetti"
Looking for something new to do with zucchini and mint, I came across this recipe for Zucchini Strands with Mint. I thought doing something like this with some grape tomatoes could make an interesting faux pasta base for broiled salmon. 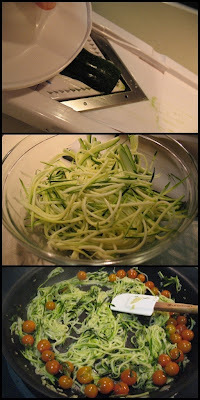 To cut the zucchini very thin, I used a mandoline equipped with an 1/8-inch row of cutting blades and the slicing blade set at 1/8-inch. If you don't have a mandoline, you could try a julienne peeler or even cut it by hand, although it will take awhile and the results probably won't be as uniform. 1. Using a mandoline, slice the zucchini into 1/8-inch strips. Toss with 1/2 tsp. salt and set in a strainer over a bowl. After 20 minutes, gently squeeze to wring out additional liquid. 2. Preheat oven broiler with oven rack about 4 inches from heat. Place salmon fillet skin-side down on an oiled, rimmed baking sheet. Spray exposed flesh with olive oil and season with seasoned salt and pepper. Broil for 10 minutes, turning over after the first 5 minutes. Check doneness and broil and additional 1-2 minutes if needed. Remove salmon skin and any gray flesh. 3. Heat 1 tbsp. olive oil in a large frying pan over medium heat. Add garlic and sauté until fragrant but not browned, 1-2 minutes. Add grape tomatoes, zucchini strands and red pepper flakes and sauté for about 2 minutes. Season with fresh mint. Squeeze lemon juice over vegetables. 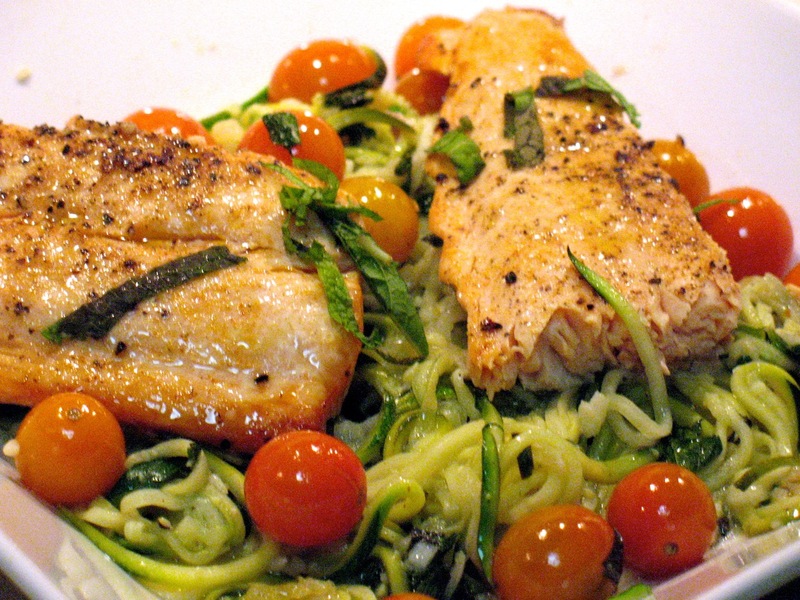 Serve in a bowl topped with salmon and additional fresh mint. This was really good. If you hadn't told me I wasn't eating pasta, I'm not sure I would've known. Kudos for being so inventive!